The David, a popular art subject was a take from the biblical story of the young boy who heroically killed the over towering giant Goliath. Other artists such as Michelangelo and Donated have created their own versions of the David, with the exception of having sculpted them in different time periods. Tangelo’s was in the early Renaissance, Michelangelo in the high, but Bering’s took place in the Baroque era, a time characterized by dramatic movement and heavenly inspiration. 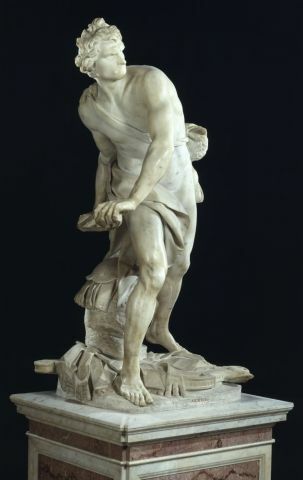 David as depicted bent over in mid-action preparing to sling a stone giving the sense of climax. The implied diagonal lines of this marble sculpture further induce the feeling of movement; Bernie Juxtaposes the concrete media of stone with the visual of an arching, flexing figure. The realism portrayed persuades the viewer that this is an average sized man that shouldn’t weigh more than one either, but we know different ?mass is an illusion. David is past the traditional contraption stance, and fully extends his upper body to the side, probably balanced by the shed armor attached to he draping, clinging from his lower half. The artist does a tremendous Job at differentiating texture, from the smooth bare skin and organic hair, to the twining rope and scaly breastplate beneath him. The lighting of this sculpture allows for high contrast– shadows made by the extending appendages, adding to the intensity of what David is about to do. Represented in life size scale, this realistic shepherd looks like he will lunge his upper body in a second or two; the anticipation gives the viewer ensign. Interactive in presentation, it is easy to feel as if we are biblical bystanders of what David is about to accomplish or even the abhorred Goliath himself, depending where you stand. The statue can be placed freestanding in any venue and viewers can make their way around the piece, getting to know it is facilitated through its human realism and proportion. Although to begin, our attention is stolen by the Davit’s potentially climactic pose, if we looked closer the face is one of the various ajar focal points. David has an extremely concentrated face as if he is making all the aerial calculations in his head to hit his target spot on. With a furrowed brow and his mouth bloated as if holding a huge breath, emphasizing the explosion of force to be unleashed. The David was commissioned by Cardinal Burghers to decorate his Galleria, where it stands to this day. During this time, Martin Luther publicized his 95 theses criticizing the wrong doings of the Catholic Church, like granting indulgences. The subsequent Protestant reformation stirred up a counter-Reformation, and in Italy where Catholicism reigned, churches cleaned up their act. Catholicism came back with vigor and heavily influenced the art world. This energy exploded through dramatic, intense and grandiose pieces to purposefully pierce the soul of viewers in an encounter with Godly power. Most paintings had biblical subject matter portrayed emotionally so the viewer could relate. Bernie was known for his interactive sculptures that stirred awe in those who “experienced” them.